Male house sparrows are easy to identify by their gray cap and cheeks and black bib. House sparrows are small birds, six inches in length, with a wingspan of seven to ten inches. They weigh approximately one ounce. Male house sparrows have a gray crown, white-gray cheek patches, black throat, grayish undersides, rusty-brown back and a white wing patch. Females and immature house sparrows are grayish-brown birds with a gray-brown crown, buff eye line, black and tawny streaks on the back and a white wing patch. Check out the Cornell Lab of Ornithology All About Birds website about House Sparrows for audio clips, ID info and life history. House sparrows are not native to North America and were purposefully introduced in Illinois four times between 1868 and 1876. By 1886, house sparrows had spread across the entire state. They are a year-round resident in Illinois and are common and abundant. House sparrows are gregarious birds. They often wait near outdoor eating areas at restaurants and other public places and will readily consume dropped food. House sparrows have also become adept at entering automatic doors at home supply businesses, where they help themselves to spilled birdseed. Birds trapped in buildings should be provided exit routes such as open windows or doors to allow them to fly out of the building. House sparrows are cavity-nesting birds and have caused severe declines in cavity-nesting birds native to Illinois such as bluebirds, cliff swallows and woodpeckers. House sparrows occupy nest cavities used by native bird species and sometimes kill the young of the native birds to take over a cavity. 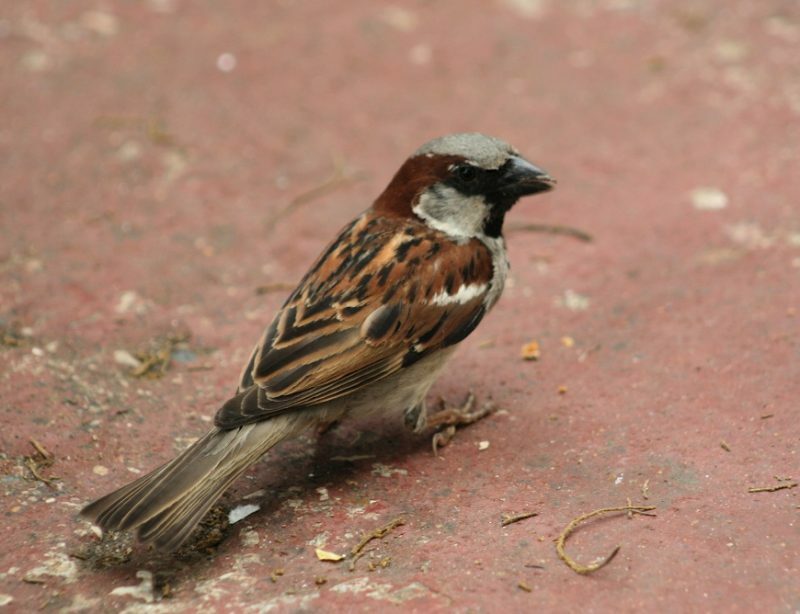 House sparrows can carry histoplasmosis and salmonellosis. Human exposure to histoplasmosis is possible by inhalation of fungal spores found in nest materials and dried house sparrow droppings. 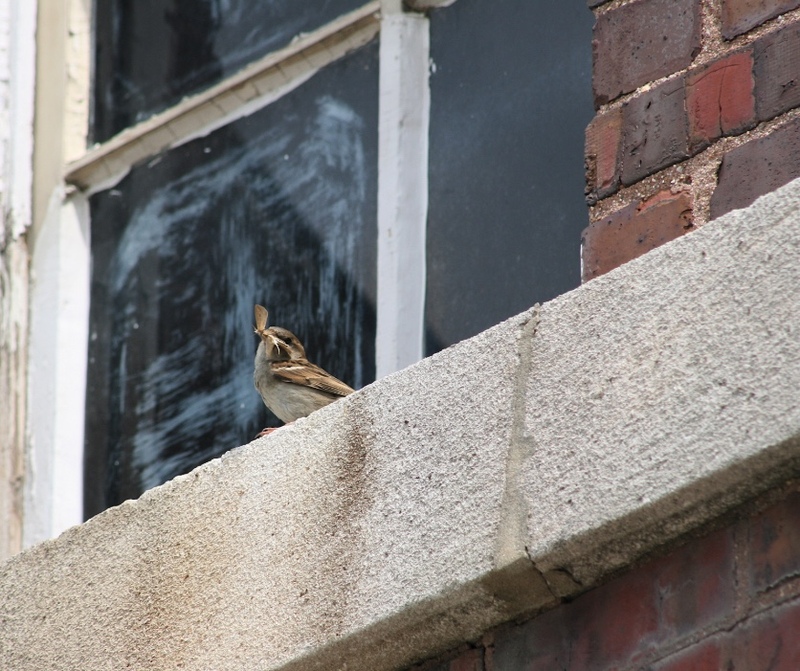 When house sparrows nest on buildings, air flow into buildings through windows and vents can expose residents to disease. House sparrows are found wherever there are people. They are common in urban and suburban areas, farmsteads, livestock areas and commercial areas. House sparrows are not found in heavily forested areas. Female house sparrow with a recently captured moth. 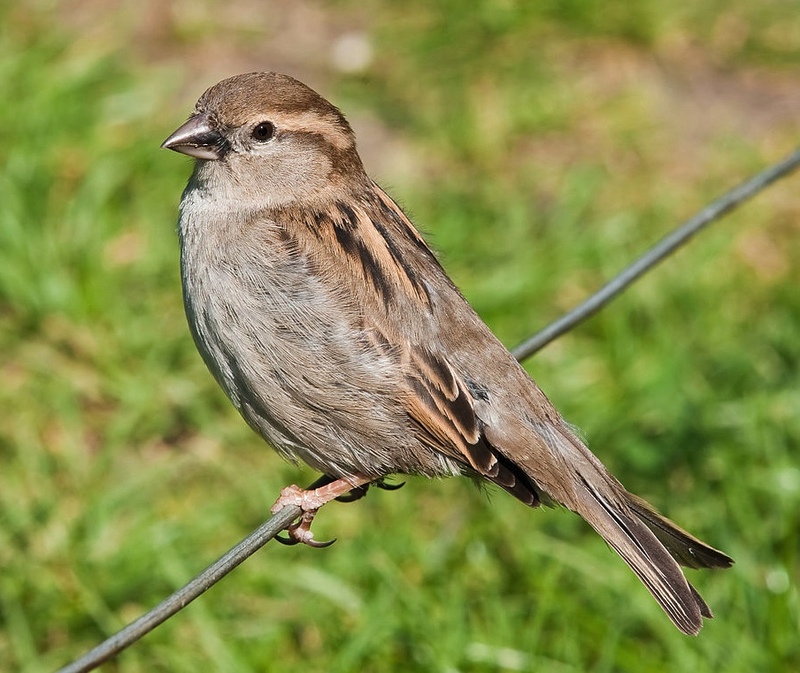 House sparrows primarily eat seeds but will also consume insects, particularly during the summer breeding months. They are common at bird feeders. House sparrows produce two to three broods per year. The nest is crudely made of grasses lined with feathers and hair. 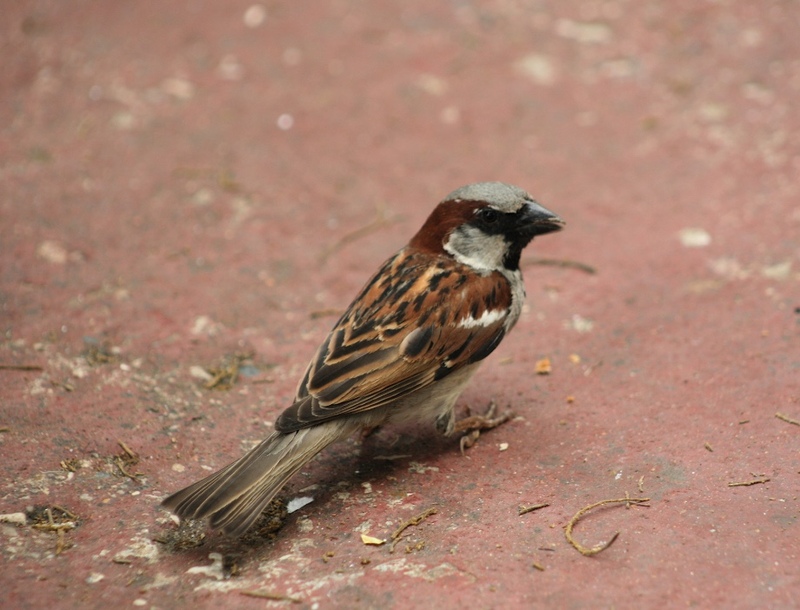 In residential areas, house sparrows place large amounts of nesting material in bird boxes, on rafters and in partially enclosed areas such as outdoor lighting fixtures and street lights, drier and kitchen vents and louvers, the spaces beneath window air conditioners, siding and fascia and in cavities resulting from structural defects of buildings. In commercial areas, house sparrows often nest in the spaces behind signs attached to buildings. The female lays three to seven eggs per nesting attempt and incubates the eggs for 10 to 13 days. Nestlings, cared for by both the male and female, will remain in the nest for 14 to 17 days. The adults will continue to feed the young for up to two weeks after they have fledged (left the nest). 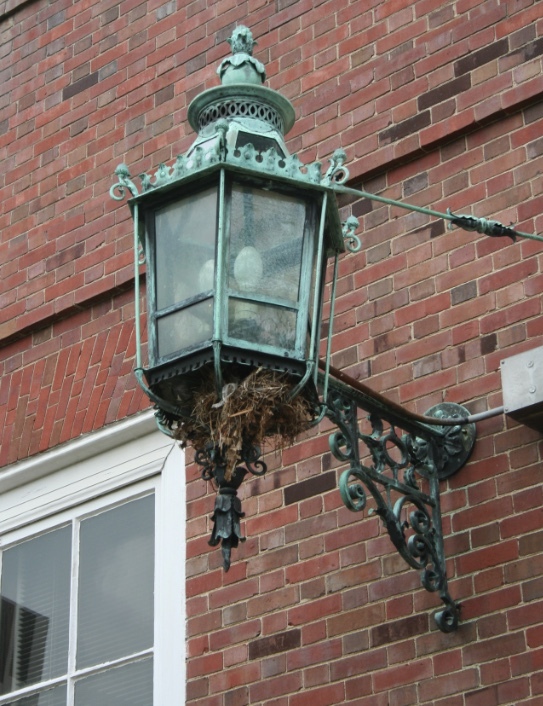 House sparrow nest in an exterior light. A large number of house sparrows do not survive their first year. A small percentage of the population may survive up to five years. Modifying the habitat can reduce sparrow numbers. If you feed birds, stop providing the types of seed (such as millet or shelled sunflower) eaten by house sparrows. Discourage house sparrows from using an area by eliminating their potential nest sites and removing their nests. House sparrow nests should be removed wherever they restrict air flow in a vent or louver. Be careful not to remove nests of other bird species, especially when removing nests from bird houses, since native birds, such as the eastern bluebird, house wren, tree swallow and chickadee, are protected by the Migratory Bird Treaty Act and the Illinois Wildlife Code. House sparrows quickly rebuild a destroyed nest, so you will need to be persistent about removing nesting material. Dispose of the nesting material in the garbage so that it is not available for the next nesting attempt. Sparrows are able to enter very small openings. Repair holes larger than 3⁄4 inch and block openings with hardware cloth. Use flat signs on buildings to avoid providing roosting sites. Screen in eaves to prevent house sparrows from roosting or nesting. Plastic bird netting can be used to exclude sparrows from bushes. Ledge protectors (commercially available strips of protruding metal spikes) can prevent house sparrows from roosting on ledges. The entire ledge must be covered to be effective. The Cornell Lab of Ornithology provides a good source of information about controlling non-native species at nest boxes. Tactile repellents are not recommended. Other birds may come into contact with the repellent, which impairs their ability to fly or stay warm when it comes into contact with their feathers. Granular formulations of capsicum may be used to repel house sparrows from certain fruits, vegetables and grain crops. Read and follow product label instructions. Frightening devices such as Mylar tape, eyespot balloons, bird of prey forms and alarm calls may work temporarily. Using several devices and moving their locations can increase their effectiveness. However, house sparrows quickly become acclimated to frightening devices. Frightening devices are not considered a viable long-term solution for house sparrow control. There are several traps available for use in house sparrow control, including funnel traps, automatic traps and trigger traps. However, trapping is typically not a good long- term control strategy. If food and shelter are available, more sparrows will quickly move into the area. Removal of large numbers of birds is best done by professional exterminators. For more information contact the U.S. Department of Agriculture’s Wildlife Services program at 1-866-4USDAWS. Shooting house sparrows may be an option in rural areas. Check local ordinances before beginning this type of control. Since the house sparrow was introduced to the United States and is not native to Illinois, it is not legally protected by the Migratory Bird Treaty Act or the Illinois Wildlife Code. A permit is not needed to remove house sparrows, their nests or their young. However, the removal technique must not pose a threat to native bird species.